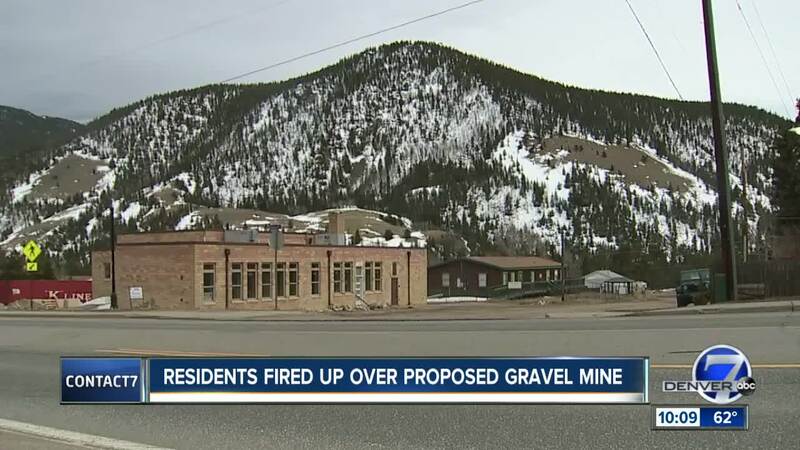 CLEAR CREEK COUNTY, Colo. -- A proposed gravel mine right off the I-70 corridor has Empire residents warning everyone in the Front Range about potential impacts to traffic. A group called Friends of Clear Creek County has been pushing back on the proposed mine after the plans came to light, and they want others to know the impacts could reach beyond their community. The call to action is becoming louder as the developers move through a state permitting process. A March deadline for a construction permit covering sand and gravel was just extended until April 30 at the request of the operator, Empire Aggregates. The project would be called the Douglas Mountain Ranch Mine and is located on the south side of I-70 near the Empire exit. A spokesperson for the Colorado Divison of Reclamation, Mining and Safety says at that time staff will make a recommendation to approve or deny the permit. If the permit is approved, the mine operator would need to apply for the necessary county permits. "Anyone going to the mountains to recreate is going to be impacted by this," said John Enochs, a longtime Empire resident. Enochs says traffic is bad enough, and fears all the gravel trucks merging onto I-70 could make matters worse. In addition to traffic, the project would completely change the quality of life in the valley, he said. He points out the proposed site which is visible from his property as he talks about the wildlife that also calls the area home. He fears the development will fragment herds of bighorn sheep and scare off other animals. He's spotted everything from eagles to elk on the land. “We see herds of 50 to 60 elk out there, we see herds of about the same number of big horn sheep," said Enochs. Air quality is another concern, especially for a the nearby Rocky Mountain Village camp owned by Easterseals Colorado. The camp caters to kids with a variety of medical needs, many are disabled and their health is fragile. "We’re afraid that all the dust from the mining operation will dump directly to the camp facility," said Krasmiri Koev, Vice President of Programs for the camp. He explains it's one of the premiere camps not only in Colorado but nationwide. He fears any negative impacts to the health of children could force them to cease operations. “It’s the one week of their year that they can come and be themselves among peers and it’s a big concern that it could go away," said Koev. An operator for the mine told Contact7, "We know there's a lot of opposition to this and a lot of people don't want this to happen but we think there's a reasonable path forward." He went on to say they will continue to stay engaged with the community and plan to reconnect with neighbors after the state permitting process.